The Orb is a directory of services for the people of Torbay. Whilst our principle aim is to help people find the right service to help them with their wellbeing, health, fitness, finances or happiness we recognise that this could mean different things for different people and therefore we contain a broad selection of services. The Orb does not judge or rate the services advertised within it, it is up to you to choose what suits you and be responsible for that decision. It is for all the people of Torbay, community and professionals alike. Only some pages (analytics) that describe what people have been searching for, which will allow us to see what is missing, will be unavailable. The rest of the site is open to everybody and no registering or sign in is required to see everything else. The Orb has been developed by a partnership that includes the Voluntary and Community Sector, the NHS, Torbay Council and the people of Torbay. Torbay Community development Trust has taken the lead in its development and retain responsibility for updating and improving the Orb. Co-production is when an established organisation works with the people who use a service to design and plan what a service does. This could be a brand new service or an existing service. Parts of the Orb that have been co-produced so far include its name, the colour and look, different ways of searching and our events page. It is expected that as the Orb is used the people of Torbay will help us change and improve the directory and website. How do you know if a service is any good or not? The Orb does not judge or rate the services advertised within it, it is up to you to choose what suits you and be responsible for that decision. We do however have a Rate & Review system that allows you to leave comments on an individual service. You can choose to take note of this information or not. Some services will have an accreditation next to it from a variety of sources that show they have been inspected and approved. Some others will show that they are part of a wider scheme that can only be used by certain funds. The responsibility for these accreditations and notices remain with the accrediting organisation. If a service receives constantly bad reviews and/or feedback we will consider removing them from the directory. 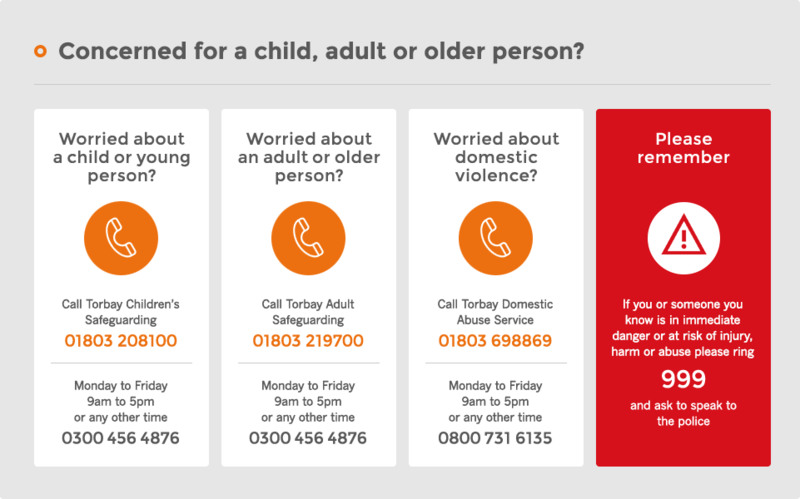 In no event will Torbay Community Development Trust be responsible or liable directly or indirectly, for damages or liabilities relating in any way to the use (or misuse) of information contained within or accessed through this site. This web site contains links to web sites not under the control of Torbay Community Development Trust. These links are provided as a convenience only. The inclusion of any link does not in any way imply or express endorsement or sponsorship, nor does not linking to a site imply lack of endorsement by Torbay Community Development Trust. How will The Orb develop? Our intention is to constantly evolve the Orb in both look and content. We take the view that nothing is permanent and we welcome suggestions and ideas that help us do this so long as they fall within our remit and budget.